In 2009, WBC proper begins at 9 a.m. on Mon., Aug. 3rd, and runs through 6 p.m. on Sun., Aug. 9. All of the action takes place at the Lancaster Host Resort in Lancaster, PA. Welcome to the first complete WBC Week ever. 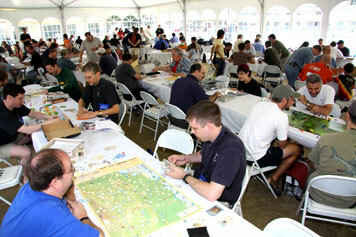 Almost 20 years in the making, the World Boardgaming Championships have finally expanded to a full seven days of non-stop gaming all yours for one low membership price covered by your normal Sustaining membership fee. I know, WBC actually covered nine days for the past several years if you count the Pre-Cons (and it still does) but this is the first time your normal membership has included a full glorious week of gaming from Monday through Sunday. WHAT IS NEW? Events held on Monday and Tuesday before the Auction used to be Pre-Cons subject to an additional fee. No more ... they're now part of WBC Week and free with your Sustaining membership. Heretofore, we had not contracted for space beyond the needs of the various Pre-Cons and thus there was no Open Gaming as such until "WBC" officially began on Tuesday night following the auction. Now, Open Gaming will have an entire ballroom for its sole use beginning Monday morning and continuing throughout the convention,. So for the first time, Open Gaming will not only be allowed, but actually featured at WBC for a full week. Hmmm ... that Golden Age of Gaming stuff? Maybe not. WBC has long gotten a bad rap as the haven of the overly serious competitive types. Now I ask you ... do these guys fit that description? Whether you like competition or just like to play games ... WBC is the place to be ... regardless of your choice of headware. And we promise to keep the looting and pillaging to a minimum. Obviously these guys have no problems letting their hair down at WBC. Oh sure, they play in the occasional tournamnt, but mostly they're just out for a good time in a crazy, male bonding kind of way that reverts to their childhood and nostalgic memories of vicarious adventures long ago in a simpler time. 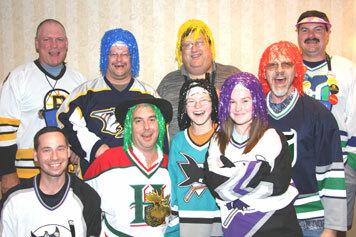 Don't you wish you could play Slapshot with these folks? WHAT'S NOT NEW? There will still be Pre-Cons subject to additional fees for non-Tribune level members but they will be restricted to events starting the preceding weekend for those wishing to get the most out of their travel buck and vacation time with a full nine days of gaming or who simply want to avoid conflicts with other events or for whom the weekends are more convenient. Those unable to take their gaming in such large doses may continue to sample portions of the week as they prefer at the same basic daily rate as before. As always, pre-registration is recommended for the most economical price. Our attendees have long lamented the many conflicts between their favorite events. So many games, so little time ... the compromise solution has been to offer a few early events in the form of Pre-Cons so that those who would like to maximize the gaming derived from their travel expense could do so without seriously detracting from the rest of the week for those unable to attend earlier. With play in a Pre-Con, those making the pilgrimmage to WBC can get more bang for their travel buck while increasing the number of events they can play during a glorious nine-day stint of uninterrupted gaming if they so choose. 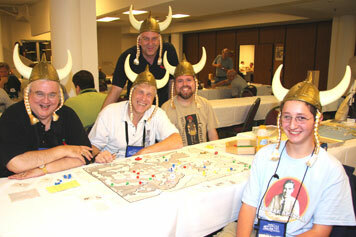 Valhalla for gamers ... here on Earth and only at WBC. But with the increase of early arrivals for Pre-Cons, more significant others were also making early appearances and we didn't have adequate gaming diversions on hand for them in those early days. 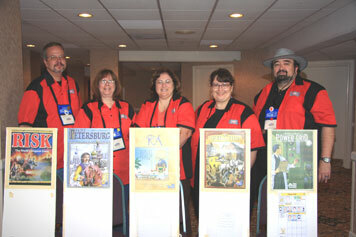 So now the Sampler Showcase is no longer a Pre-Con, but the centerpiece of our Open Gaming days for early arrivals. Open Game to your heart's content with the games of your choice or join in any of the ten scheduled demonstrations of new games which will begin approximately every two hours. The Juniors Program will begin at the usual time: 6 pm on Tuesday. Events will run from 9 am rhrough 9 pm Wednesday through Saturday, with the last event ending at noon on Sunday. Teen demonstrations and social events will run in the Juniors room from 9 pm through 11 pm on Wednesday through Saturday. Last year, some of the Open Gaming venue included a poolside pavillion with state of the art air conditioning and lighting which allowed adults to keep an eye on the kids frolicking in the pool from a comfortable vantage point while gaming the day away. 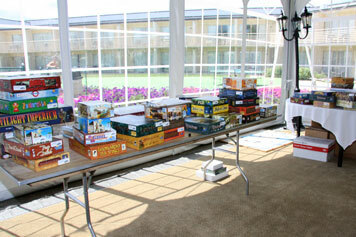 The BPA Open Gaming library made it first appearance poolside in the pavillion to facilitate trying new games. A simple signout procedure allowed any guest to freely try any game in our collection. After a slow start, the pavillion soon became SRO. BPA GAME LIBRARY: Freely borrow any game from the BPA Game Library to give it a whirl. Game publishers worldwide will be providing library copies to help introduce you to their offerings. From those donations, the Sampler Showcase 'Splainers will select ten to give scheduled demonstrations and hands-on teaching sessions. What better way to see what games will appeal to you than to actually give them a trial run in Open Gaming at WBC. The purpose of the Sampler Showcase is to serve as an introduction to new games and is open to games of all types. Those who enjoy playing new games and starting off even in experience should relish this opportunity to experience new titles in a non-tournament format. If you ever wanted to just try new games, here is your chance. The demonstration phase of Sampler Showcase will start on Monday at noon and run until 5 PM Tuesday when the full slate of WBC tournaments begin as usual. WHAT WON'T CHANGE: The lion's share of tournaments at WBC will still commence after 5 PM Tuesday. A very limited number of tournaments will be run on Monday provided they do not overlap the auction or each other. During auction hours, event choices will be limited to Open Gaming, Sampler Showcase demos and the continuing rounds of earlier Pre-Cons. WBC encourages clubs and teams to make their bonds known as groups can compete and enjoy their shared successes just as much as individuals. 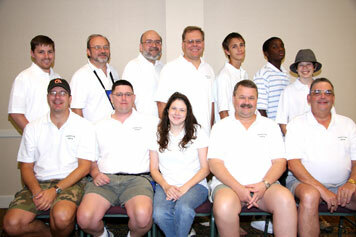 Team shirts such as those worn by the Dream Team above lend an esprit de corps to the Team Tournament. Club shirts can be even more effective in lending a sense of identity to your group and help recruit new members who may not have been aware of your existance even though in your area. 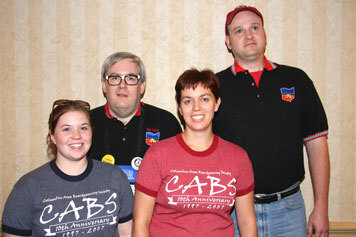 Heck, even CABS members look good. Well, most of them anyway. Team Heterodyne not only dress the part, they display their game prefereneces too. Their only gripe are that teams are a multiple of four - not five. 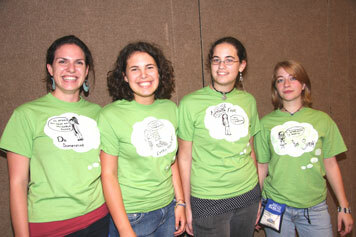 Nobody outdoes the Greenville Mafia whose group shirts change color every day. If it's white, this must be Tuesday. WBC special room rates at Lancaster Host, Continental Inn and Red Roof Inn apply to all nine days of WBC and its pre-cons including the day before and day after to ease your travel regimen. See our Hotel and Travel Page. Last updated 12/14/08 by kae.